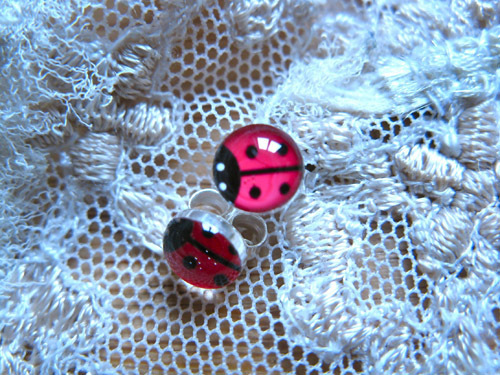 If you want to remind a special friend or loved one to be lucky and positive and at the same time let them know how much you care, let us send these adorable little ladybird earrings on your behalf. Ladybirds are generally regarded as a symbol of luck and good fortune and make a meaningful present to wish someone success. Description: These sterling-silver and enamel stud earrings measure 5mm in width and have sterling silver posts and backs. Let these sweet little ladybugs work their magic. They come gift-wrapped, like all our presents (with an information card) - and we can print a personal message on your behalf. More information about the Ladybird lucky symbol . .